Ten Off-Road Champions emerge from year-long competition held in both United States and Baja, Mexico SAN DIEGO - Concluding a grueling combination of six off-... See More . . .
December 4, 2013 Saturday, Dec. 14 in San Diego Voting continues to 11:59 p.m. Dec. 11; SCORE’s 40th year ends with SCORE Off-Roadsman awards, presentation of... See More . 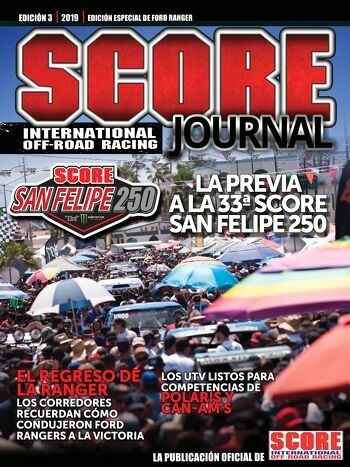 . .
December 3, 2013 Highlight package to include key elements from extensive Dirt LiveHD coverage of race week SAN DIEGO—Highlights from extensive week-long coverage of the recent 46th annual Tecate SCORE Baja 1000 has been packaged into a one-hour... See More . . .
Baja 1000 Nov 20, 2009 .RM 92. Honda Ridgeline Honda Ridgeline: a transverse 3.5-liter 24-valve, SOHC VTEC® V-6, a five-speed automatic and Variable Torque Management® 4-wheel-drive system. Information: automobiles.honda.com/ridgeline/baja-racing & RIDGELINEownersclub.com Original soundtrack, Film & Edit by Jay Mayer... See More . . .